An indisputable fact about firing long strings of shots during load development is that things that shouldn&apos;t change will change. Your barrel will warm and foul. The wind conditions will change. The lighting conditions will change. Your heart rate and other bodily functions will change, affecting your trigger prowess. These are unavoidable variables that can and will skew your load development results--no matter how hard you try to compensate for them. In the conventional Audette or "ladder" test, you fire a string of twenty or so shots at a target 300 yards away. The idea is to look for a cluster of shots on that target which will represent the best charge weight of powder to use. However, during this string of fire the above mentioned variables--either individually or in concert--will certainly skew your results to one degree or another. You might pull a shot or two during the string. Having only one representative shot of each charge being looked at is not the best approach in my opinion. But consider the round robin firing sequence. 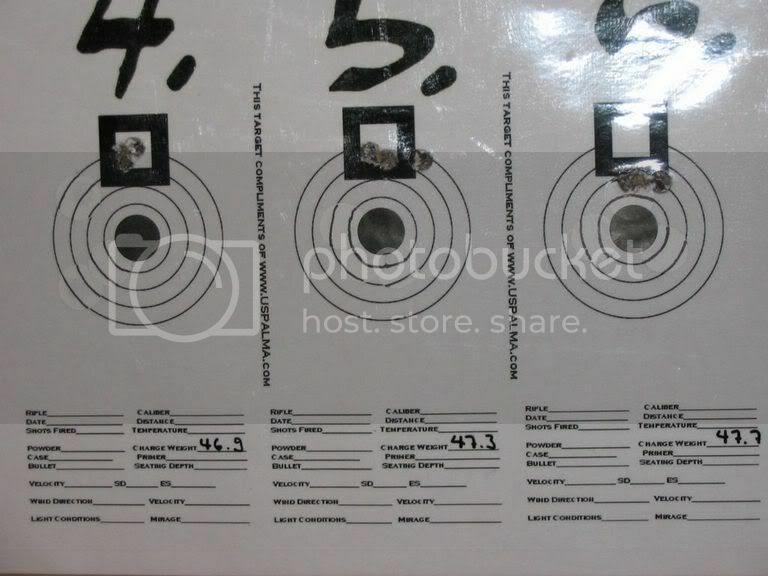 By firing "round robin" I simply mean that you dedicate one target to each charge weight being tested, and you shoot once at target number 1 with the first graduation, and then once at target 2 with the second graduation, etc., until you&apos;ve been through all targets three times each, leaving a three shot group on each target. This method spreads the error factor across all groups equally--and you get three shots of each charge weight--rather than the Audette ladder test&apos;s one shot. So, if the barrel fouls and becomes inaccurate after 8 or 10 shots, the flyers will be evident in all groups tested. This will yield more meaningful data, and is statistically superior to the conventional Audette method. I prefer to shoot the initial stage of OCW testing at 100 yards. This will factor out most of the wind effect. In the overwhelming majority of cases, 100 yard data is easily interpreted, and more easily obtained. Many shooters don&apos;t have immediate access to 300 yard ranges. From my own experience, I can tell you that if you properly interpret your 100 yard targets you&apos;ll have an excellent 300 yard (and even farther) load recipe. Almost every load I&apos;ve developed at 100 yards has printed MOA or better at 300 yards. Some of these loads have done extremely well at 600 yards and farther... the following group was shot at 1062 yards using a load developed at 100 yards. There are some great guys out there who have been using the Ladder Test for eons to get to a good load recipe. 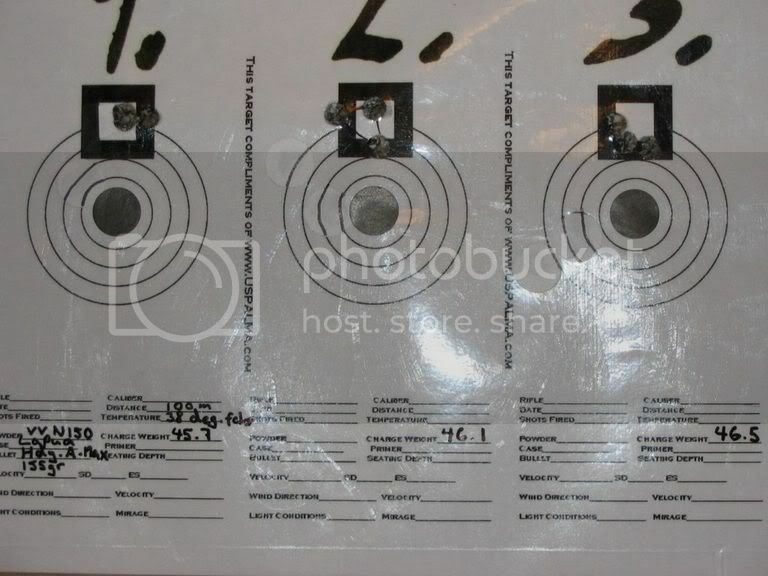 While many have had good results with the loads they&apos;ve developed in this manner, others have reported difficulty interpreting the results on the target. Still others have claimed that they [i]have[/i] properly identified a wide accuracy node with the Ladder Test--but will also tell you that the seating depth is critical, or that primer selection is critical--otherwise the load "goes all over the target." If this is the case, the liklihood that the individual is truly using the best powder charge is slim. Don&apos;t get me wrong--you can use an inopportune powder charge and get away with it. You might even win a match or two with it. But if you&apos;re having to keep to critical tolerances just to keep the load from exceeding MOA, you&apos;re "walking the tightrope to accuracy." One of the reasons I designed the OCW load development method is that I was one of those guys who found that results from a 200 or 300 yard ladder test were often inconclusive. I knew that the method had (and still has) merit. But I also knew that there had to be a better way. With the Ladder Test, it is generally recommended that you fire 20 shots in graduated powder charges of around .2 grains (.3 grains on larger cases). You are to begin at the published starting load, and proceed upward. You fire at the same bullseye, and watch for a succession of shots to cluster at some point (or points) along the continuum. An aside: In my opinion (and others now share it) you will be wasting bullets, powder, and barrel life on the first 8 to 12 of those shots. While it is of course important to work up from lower powder charges (beginning published loads), you should not be too curious as to whether you find an accuracy node in the area just above the starting charge level. Do you want your 30-06 to act like a 30-30? Or your 220 Swift to act like a .223? We choose a rifle chambering based on an expected performance level from that cartridge. Since it is doubtful that you will be willing to settle for a reduced velocity load, you should move quickly through the first half of the charge weight range by stepping up in larger increments to begin with. The main thrust of this piece is to (hopefully) bring the reader to an understanding of what can go wrong in a ladder test--even a perfectly executed ladder test--which may lead them to incorrect conclusions as to the best powder charge to use. Engineer Chris Long has introduced the concept of the Shock Wave&apos;s effect on barrel behavior. Chris and I have corresponded for over three years on matters of load development, and with his educational background he was quickly able to discern how OCW loads work--and has even developed a method to predict OBT (Optimum Barrel Times). Note that "OBT" is Chris&apos; terminology. RSI (a company I would assume many of you are familiar with) has a working relationship with Chris Long, and Chris has written some of the software for RSI&apos;s ballistics programs. Here are a couple of links, first to Chris Long&apos;s Shock Wave pages, and then to RSI&apos;s notes wherein they give credit to Chris for his work. I offer the above information as a segue into the "scatter group," and its significance to the powder charge continuum in a particular load work-up. I show all of the targets above because I want to illustrate the importance of the "scatter group." This will be one group of the round-robin sequence that seems to inexplicably open up. The reason for this? The Shock Wave, as identified and described by engineer Chris Long in the page linked above, is at the muzzle when those bullets are being released. Generally, a 1 to 2 percent powder charge increase above the scatter group charge weight will have you right in the OCW zone. But the real reason I wanted to discuss the scatter group is this: Please note that in each of the scatter groups shown above, ONE shot lands right on the same POI (or within 3/8 MOA or so) as the groups preceeding and proceeding it. This means that in at least one of three instances, during a conventional Ladder Test, the target would indicate a wide "sweet spot" where it should not. The OCW round-robin testing easily identifies the problem with this charge weight level, but in (at least) one of three instances, the Ladder Test will miss it--which may lead a shooter to an incorrect conclusion as to the center of the true accuracy node. Sure you can go back and prove and re-prove your Ladder Test results--but if you&apos;ll take the time to understand the OCW/round-robin firing sequence, you&apos;ll not have to do any such re-proving; you can move right on to depth tuning (adjusting the seating depth of the bullet for absolute accuracy). 1062 yards, .243 win, 105 AMAX and 48.5 grains Retumbo.